The Mk II was the only version of the Lancaster not to be powered by Rolls Royce Merlin engines. Instead it used Bristol Hercules engines and the MKII was the only version to use wooden propeller blades. Work on the prototype Mk II began soon after the Mk I was complete, and the first prototype flew on 26 November 1941. The new model was produced by Armstrong Whitworth, with work beginning in March 1942. Ironically, while Rolls Royce was free from serious attack, the Armstrong Whitworth factory was itself bombed in June 1942, delaying the appearance of the Mk II. By the time the Mk II entered service in October 1942, the threat to the Merlin was already receding. Initial service tests with No. 61 Squadron early in 1943 reveals one serious limitation – it had an unexpectedly low service ceiling. On its first test, against Essen on 11/12 January, two Mk IIs joined a force of Mk Is. While the Mk I operated at 22,000 feet, the best the Mk II could achieve was an altitude of 18,400 feet, while the second aircraft only reached 14,000 feet! After tests were complete, the Mk II was issued to No. 115 Squadron, in No. 5 Group. Despite the altitude problems, the Lancaster Mk II was a welcome improvement on their Wellingtons. In service the Mk II was slightly more robust than the Mk I, lacking the extensive liquid cooling systems needed by the Merlins, although at the lower altitude this would be put to the test. An additional aid to survival was the installation of a FN64 ventral turret below the aircraft, although this was sometimes removed to save weight. We found a serviving propeller thats clearly dated 1943 in very poor condition. All the glued laminations had perished and on inspection the propeller basically totally fell apart, the only sound piece of timber was the bottom quarter. 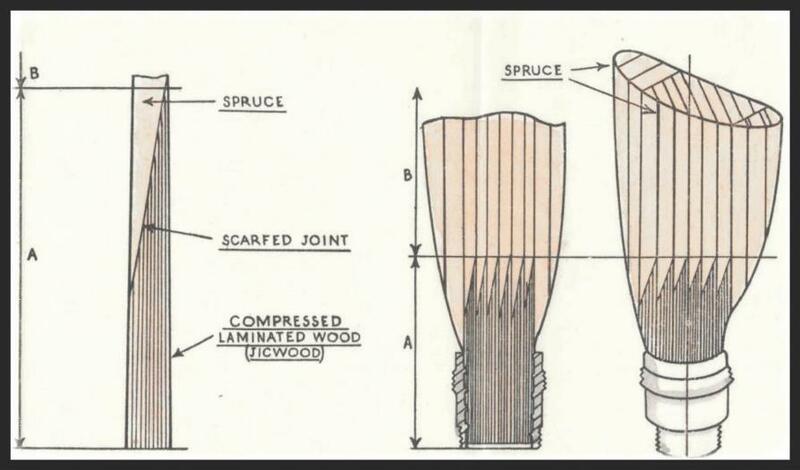 Construction drawings of a WWII wooden propeller like the Lancaster MKII wooden propeller. We have managed to reglue and use a good 50% of this section for making pens, cufflinks and keyrings. This is in very poor condition and mostly unusable, but we have managed to make just 8 bespoke pens. This section is probably the hardest wood we have ever come across, its very dark with many thin layers of timber impregnated with resin. This section has also suffered and has split into many sections due to, we believe by being left out side at some point. We will be making a limited number of pens from this section.